Welcome to North Carolina MomsRising! We are more than 42,000 members strong in North Carolina, with members from all 100 counties. Together we work on a broad range of issues including paid family leave and paid sick days; access to high quality, affordable early learning; protecting children and families in the state budget; access to health care and oral health equity; standing with immigrant families; gun violence prevention; protecting children from exposure to toxic chemicals; maternal justice; pregnancy accommodations; hunger and food insecurity; engaging families in the voting process; holding legislators accountable for advancing policies that support NC parents and families; and more. Join our NC Facebook group to stay up-to-date on all that’s happening in North Carolina. Ready to join us? Here's how! Check out our latest opportunities for action down below. On Facebook? We have an online community for our North Carolina members – join here! Questions? 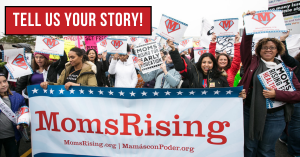 Reach out to our North Carolina State MomsForce Director, Beth Messersmith, at beth@momsrising.org. We're making a difference for women, moms, and families in North Carolina, and we want you to be a part of it! 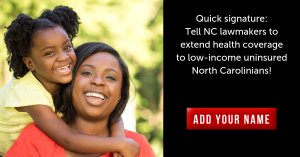 Quick signature: Tell NC Lawmakers to close the health coverage gap! With mounting pressure to close the health care coverage gap in our state, lawmakers at our general assembly need to hear from you! North Carolina: We want to hear from you! Together, our voices are powerful - RSVP now! Let's march! 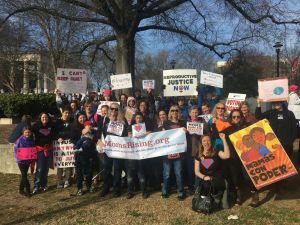 Join MomsRising at the HKonJ Moral March on Sat, Feb 9! Our partners at Moms Demand Action are convening a community roundtable on Feb 13th to address gun violence in our community. Come make your voice heard.